Sixteen years ago, Henry Evans was driving his kids to school when he suddenly fell sick – He started slurring his words and had trouble seeing. In a matter of hours, he went into a coma. When he came out of his coma, he couldn’t move or speak. Several years later, Evans is using a new system that lets him interact with his family using his brain and eye signals. Evans wears a headband that along with a sensor on the bridge of his nose, can track signals from his brain and eyes, and help him navigate and control a tablet without physically touching it or speaking to it. Evans can use pre-written messages like “I need water” or “I’m in pain” – very similar to how other AAC apps work. 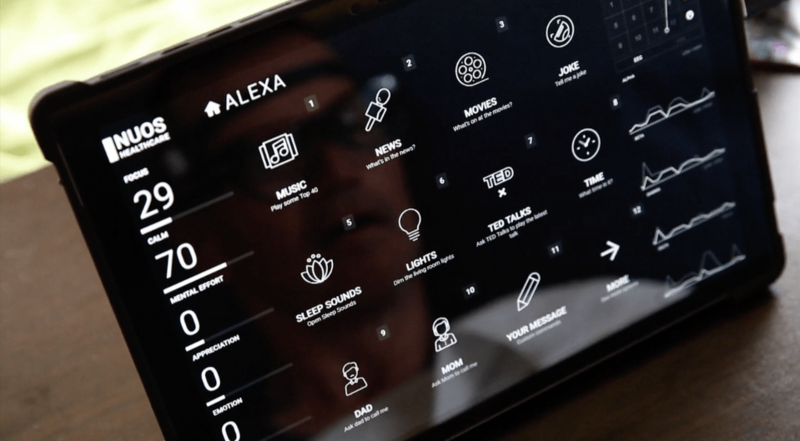 However, with this system, he can also invoke “Alexa” commands as well among other things, all from one interface. This system, called Nuos, is designed for people who are paralyzed and unable to talk. Francois Gand, CEO & co-founder of Nuro , the company that built Nuos, explains that Nuos helps people start interacting again with the world – family members, doctors, nurses, caregivers etc. What’s really interesting is that by monitoring signals from the brain and eyes, and recognizing patterns in the data, the system gives the patient the ability to control the user interface. The system also uses artificial intelligence to predict the interface a patient should use. For example, someone who just had a stroke would start with a simple interface that gradually becomes more advanced as the patient gets comfortable with the system. 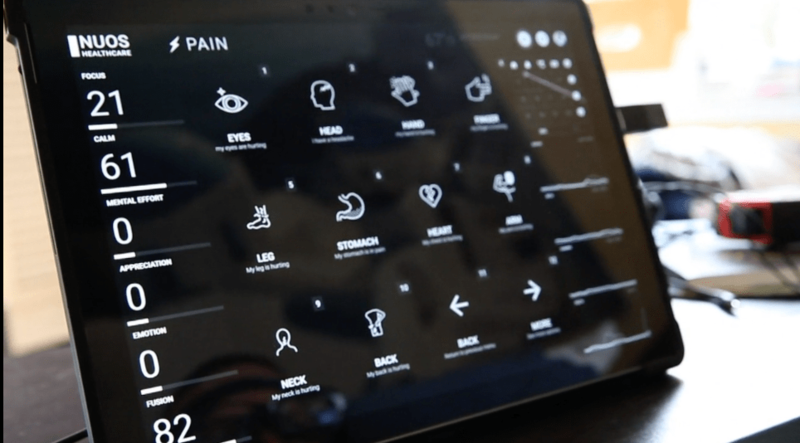 Besides using pre-written messages, invoking Alexa skills and typing messages using brain and eye signals, Nuos also allows the patient to browse the internet, connect to external robots, and support many other uses. Evans considers Nuos a breakthrough especially for people who cannot move their head. According to the source article, Nuro is preparing for large scale trials with health systems in the US and Canada. Watch the video below to see how Henry Evans uses Nuos and check out the source article for more information. Nuos Interface showing pre-written messages. 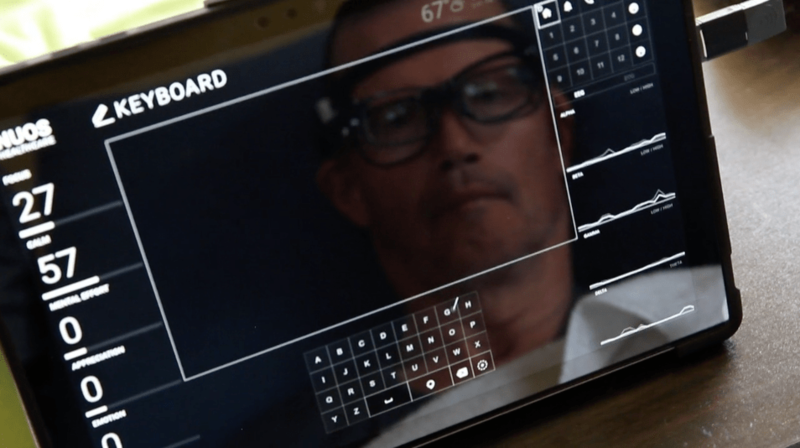 Nuos lets Henry Evans type with brain and eye signals.